Cheswick the Lifeguard Crab is the official pedestrian and bicycle safety ambassador for Ocean City, Maryland. If your summer travel plans include surfing Coastal Highway, please help Cheswick keep area road ways safe. Cheswick will be out and about promoting OC Walk Smart! which is a partnership between the Town of Ocean City, Ocean City Police Department, the Maryland Department of Transportation State Highway Administration (MDOT SHA) and other local businesses and agencies. The collective goal is to raise awareness about the rules of the road to keep Ocean City residents and visitors safe this summer. Coastal Highway, a multi-lane highway, requires full attention while navigating whether on foot, bicycle or in a vehicle. It is imperative to be free from distractions like mobile devices and ear buds. 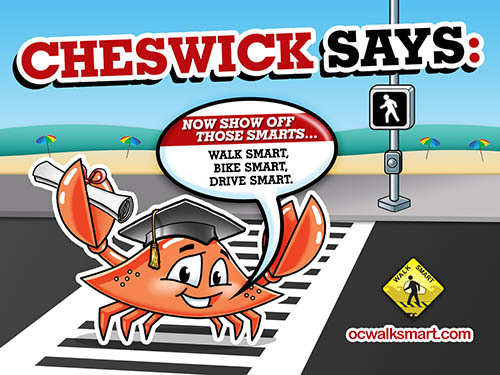 Cheswick and the OC Walk Smart, Drive Smart, Bike Smart campaign focuses on helping residents and visitors reach the beach safely and stay safe while in Ocean City. The Town of Ocean City swells to one of Maryland’s largest cities during the summer months with a population that changes each and every weekend. Through the three E’s of safety – engineering, education and enforcement, MDOT SHA and partner organizations are working together to keep Ocean City streets safe. Coastal Highway (MD 528) is a major highway that carries six lanes of traffic – more cars, more feet, more bicycles in a single summer month than it does during all the nine months of fall, winter and spring. Cheswick loves Senior Week visitors! From May 30 – June 15, outreach focuses on visiting seniors through a partnership with the Play It Safe campaign. Backpacks and other educational items with “Walk Smart” message are distributed at Play It Safe events which are designed to safely entertain new high school graduates. If you are visiting Ocean City for Senior Week, please remember to be cautious when crossing any roadway, especially Coastal Highway, to always use marked cross walks and avoid distractions when walking, biking or driving. If you are a parent of a visiting senior week student, remember to review the rules of the road with your child. Emphasize the importance of traffic safety, especially on Coastal Highway – a major Ocean City thoroughfare.